This shop has been compensated by Collective Bias, Inc. and its advertiser. All opinions are mine alone. #LoveDoveFruits #CollectiveBias I have the BIGGEST sweet tooth, especially while I’ve been trying to stick to my health and fitness goals for 2016. What I’ve found is the more I tell myself I can’t have something, the more I want it. In an effort to be more realistic about making lasting lifestyle changes, I’ve realized that having better-for-you treat options (like DOVE® Chocolate Fruit & Nut ) has made it easier to give myself a reward without having to undo the the good choices from the day. I haven’t always been a fan of dark chocolate because of how bitter it can be. Dove® makes one of my favorite dark chocolates, theirs is creamy, rich and smooth. I especially like the DOVE® Dark Chocolate Raspberry & Honey Roasted Almond Fruit & Nut combination because the fruit adds a natural sweetness. The more I eat dark chocolate the more I prefer it over milk chocolate, plus it has all of those antioxidants so I know it’s better for me. 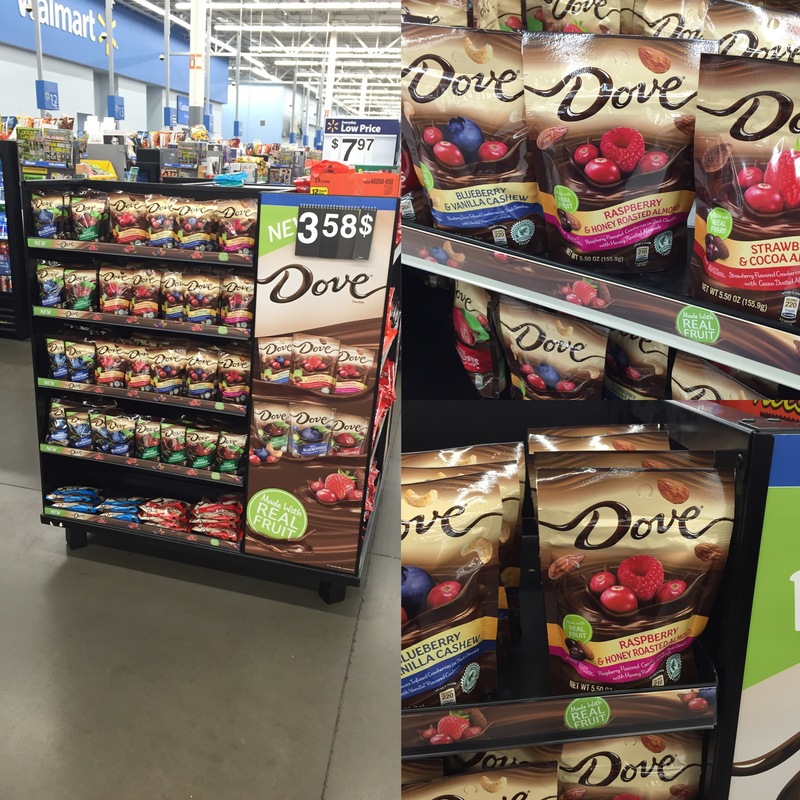 The next time your checking out at Walmart, look for the new DOVE® Chocolate Fruit & Nut products on a special in-store display. Pop the popcorn, and pour it into a sheet pan removing all of the un-popped kernels. Combine the almond butter, honey, vanilla and salt in a microwave save bowl. Heat for 30 seconds on medium-high heat and stir. Repeat if needed. The almond butter sauce should be an even and smooth consistency, easy to pour. Pour the almond butter sauce over the popcorn. Return to a large bowl and toss until evenly coated. 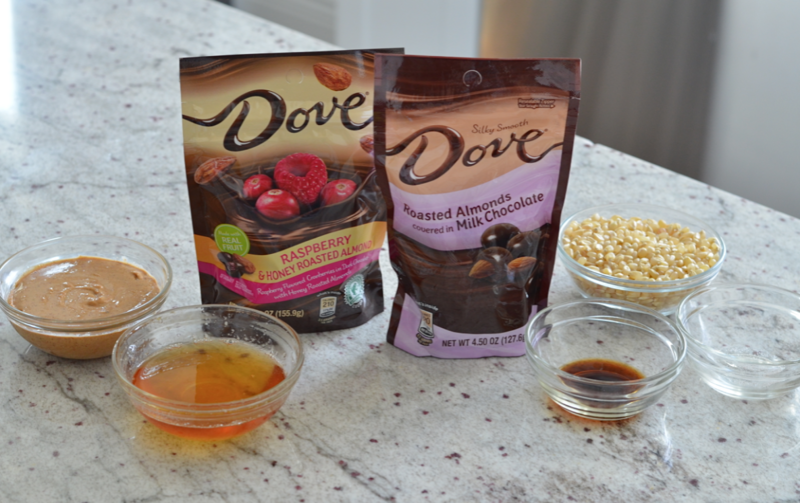 Add a generous amount of DOVE® Dark Chocolate Raspberry & Honey Roasted Almond, and mix again. Form popcorn mixture into balls with your hands and set on a non-stick silicone mat. Enjoy right away, or allow a few hours for them to harden. There were so many options to choose from, but grabbed the DOVE® Dark Chocolate Raspberry & Honey Roasted Almond, DOVE® Dark Chocolate Strawberry & Cocoa Almond, DOVE® Dark Chocolate Cranberries, DOVE® Roasted Almonds covered in Milk Chocolate and we enjoyed them all. As I mentioned earlier, the DOVE® Chocolate Fruit & Nut display was conveniently located right at the checkout lanes at Walmart. Make sure to print off this COUPON before you go to save $1 on your purchase. When you do purchase them, make sure to store them in an inconspicuous location, so your husband doesn’t leave an empty bag for you on the shelf… just saying. What is your favorite better-for-you treat that helps keep your on track with your fitness goals for 2016?